Johnny Depp was looking calmly somber when we met. Just a few hours after news reports on the first American bombing campaign in Afghanistan, a serene Depp questioned the validity of doing press for his latest film, From Hell. “Do you find it strange to be here, talking about this?” he quietly questions. In From Hell, set in 1888 London, Depp plays an opium-addicted police inspector on the trail of the vicious Jack the Ripper. Asked if it is the right kind of film to be released at this point in time, Depp is circumspect. “I think that movies, if they do anything at all, provide a degree of escape from reality for a couple of hours. I’m not so sure that this is the one that people will necessarily want to escape to. 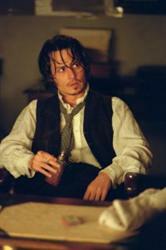 But it is, after all, only a movie.” Depp feels at home playing this nineteenth century character. In a career spanning close to 20 years, Depp has consistently defined himself by his choice of diverse characters. Making his screen debut in the original Nightmare on Elm Street and achieving initial fame on television’s 21 Jump Street, Depp’s gallery of screen roles range from the title character in Tim Burton’s whimsical Edward Scissorhands, through to diverse characters in the likes of Cry-Baby, Ed Wood, Dead Man, Fear and Loathing in Las Vegas, Sleepy Hollow, and more recently, in Before Night Falls, Chocolat and Blow.